stopped. 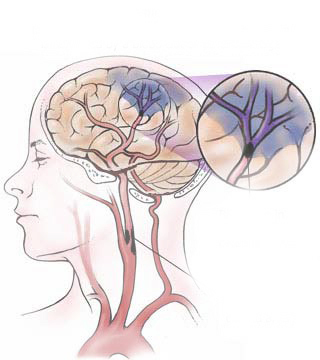 A stroke may also be called a cerebral vascular accident, or CVA. Over 2,400 years ago apoplexy, from the Greek word meaning "struck down with violence,” first appeared in Hippocratic writings to describe stroke symptoms. In 1658, in his apoplexia, Johann Jacob Wepfer identified the main arteries supplying the brain, the vertebral and carotid arteries. He identified the cause of ischemic stroke when he suggested that apoplexy might be caused by a blockage to those vessels. About 80% of all strokes are ischaemic. More than 20 million people worldwide suffer from strokes each year. More women than men have strokes. Approximately 70% of people who have a stroke are over the age of 65 years. Continous tension stimulates the adrenal gland to secrete harmful substances like adrenalin and cortisol in blood circulation. Significant emotional stress has also been associated with heart attack, stroke, increased risk of abnormal heart rhythms and higher levels of cholesterol, thereby a higher incidence of coronary artery disease. Anger, anxiety and hostility are toxic for our health. Nervousness, fear and worry reduces life to ashes. Stress leads to stroke, hypertension, diabetes and doubles the risk of cardiovascular diseases. Stress leads to alcoholism and smoking which hastens arteriosclerosis. Disability affects 75% of stroke survivors. If the stroke is severe enough, coma or death can result. Physical disabilities of stroke include paralysis, pressure sores, pneumonia, incontinence, and pain. 30 to 50% of stroke survivors suffer post stroke depression which is treated with antidepressants. Early use of anticoagulants to minimize blood clotting. Controlling the glucose level may minimize the size of a stroke. Oxygen is given as needed. Unconsciousness is only a symptom, it is the external tangible manifestation of the dynamic derangement of the vital force. Uncommon and peculiar symptoms denote the individuality of the patient and are the basis of homeopathic prescription. We have to attach great importance to the mental symptoms while treating cases of cerebrovascular accidents. The mental symptoms of homeopathic drugs have been beautifully depicted in the Materia Medica and repertory. CUPRUM MET., LACHESIS, OPIUM, PLUMBUM MET, STRONTIA CARB, and ZINCUM MET. ARSENICUM ALB, BELLADONNA, CALENDULA, GLONOINE, GELSEMIUM, IGNATIA, NATRUM MUR. CRATEGUS OXYCAN, RAUWOLFIA SER, ARJUNA TERMINALIA.